Several David Lindsay-related musical bits of news. 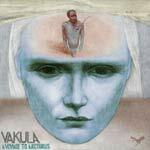 Vakula's A Voyage to Arcturus album came out in January, and is available on vinyl and CD, (also free through various download sites, but as I'm not sure if these are official, I'll instead link to Vakula's own Soundcloud page). I have put a brief review of it here. Also of interest is 'alt-rock' band Malenky Slovos, from Italy, who have released a song called Matterplay (Soundcloud link here). This uses David Power's composition, also called Matterplay, which can be heard here, on Soundcloud. And Akashic Fish have released a 3-track electronic album on Bandcamp, called A Voyage To Arcturus/Out of the Silent Planet (via the Northside).